Teriyaki Chicken Caesar Salad is perfect for a light dinner and summer parties and potlucks. Best of all, it’s easy to make and packed with avocado, pineapple, asparagus and tender Teriyaki Chicken. Hellooo June! My absolute favorite month because it means the official start of grilling season and SALADS!! Caesar salad just happens to be the ONLY salad my husband gets excited about. If I’m being completely honest, I can’t say that I share that same love. But ever since I made this loaded Pineapple Teriyaki Chicken Caesar Salad, it’s my new favorite salad to date! I love adding a tropical and Asian twist to dishes. And you know what? It totally kicked up the flavors in this Caesar salad! Plus the addition of teriyaki chicken and juicy, sweet pineapple is just amazing! 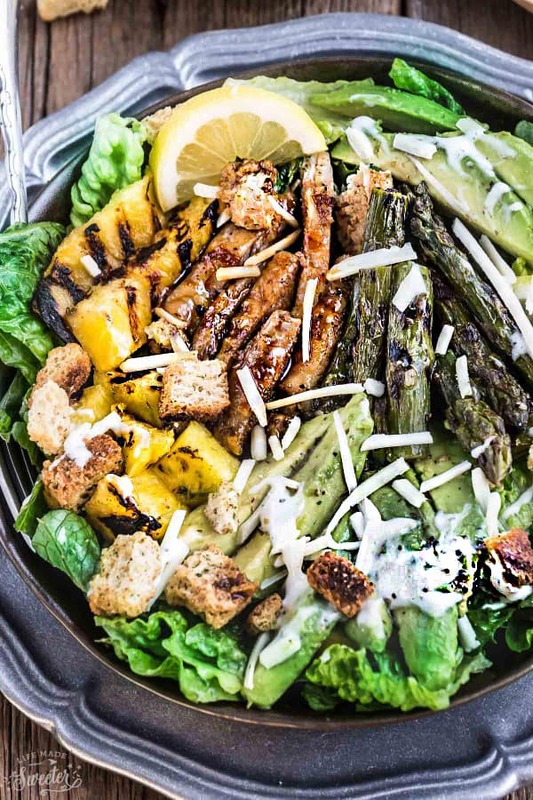 Top the crispy greens with some grilled asparagus, avocado, grated Parmesan and crunchy croutons. Every forkful is just full of an explosion of flavors. The best part about this? My go-to teriyaki sauce and the homemade Caesar dressing each take less than 5 minutes to make! So you can have everything ready in just 30 minutes. If you’re in a pinch, you can totally use your favorite store-bought versions instead. 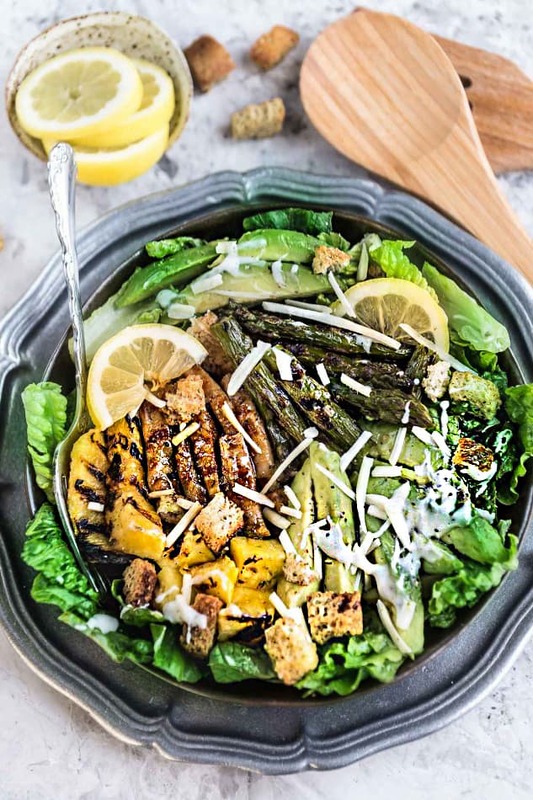 Pineapple Teriyaki Chicken Caesar Salad loaded with creamy avocado, sweet, juicy pineapple, grilled asparagus and a flavor-packed Teriyaki Chicken alongside a bed of crispy greens and crunchy croutons. Plus the homemade Caesar dressing is lighter with no mayo! For the grilled portion: - Preheat grill to medium-high heat. Meanwhile, combine all the sauce ingredients into a small saucepan. Stir over medium heat, bringing to a boil and thickened. Remove from heat. Brush half of the sauce onto the chicken breasts, reserve 2 teaspoons for the Caesar salad dressing and the rest for basting the chicken. 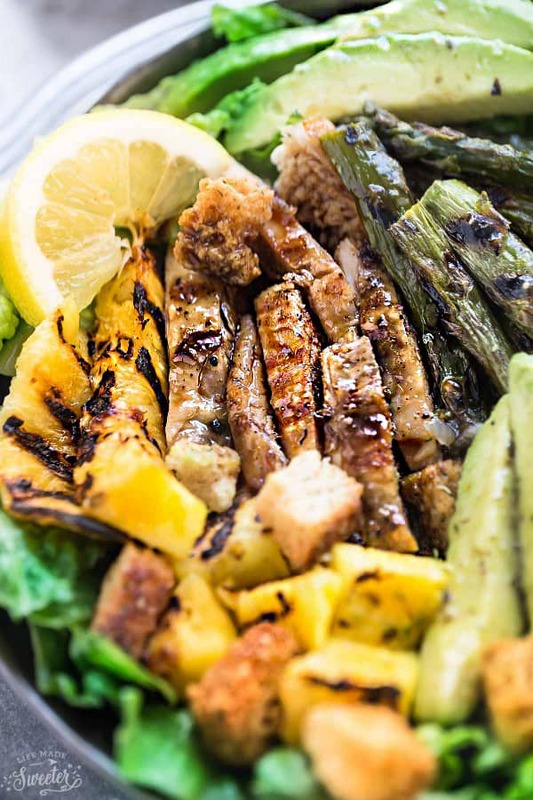 Lightly oil the grill grate, and place chicken, pineapple wedges and asparagus on the grill. 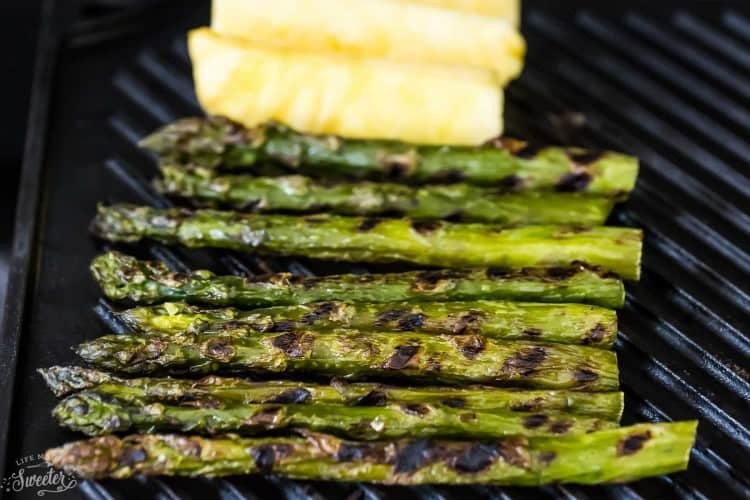 Cook pineapples and asparagus for 2-3 minutes per side, or until grill marks appear. Remove and cut into slices. Cook chicken for 6 to 7 minutes per side and brush with sauce 2-3 times. Chicken is done when the meat is firm, and juices run clear. Remove, allow to cool slightly, and cut into strips.Brush with remainder of sauce. 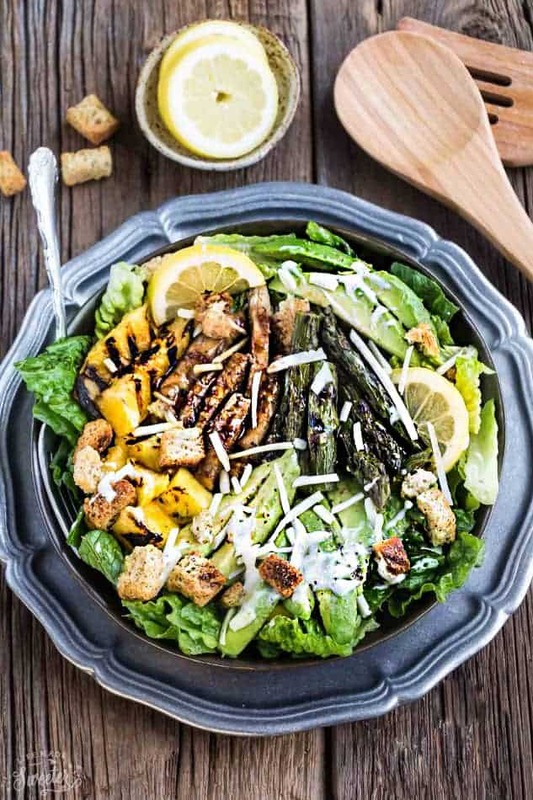 Make the dressing - While the chicken is cooking, make the Caesar Dressing: In a bowl, combine the Greek yogurt, lemon juice, olive oil, reserved 2 teaspoons teriyaki sauce, anchovy paste, mustard, Worcestershire sauce and garlic and whisk together until smooth. Stir in cheese and add salt and pepper to taste. (Can make ahead the night before and store covered in the fridge). To assemble - Just before serving, add all of the salad ingredients to a large bowl. Drizzle in desired amount of salad dressing,add croutons and gently toss to combine. Top with grilled chicken, more Parmesan cheese and chopped parsley, if desired. *For an even quicker and easier option, feel free to use your favorite ready-made teriyaki sauce and Caesar dressing, if desired. Don’t forget to check out what other amazing dishes everyone else is sharing for 30 Minute Thursday!